The Our Lady of Mt. Carmel Church in Lipa City as it looks in the present day. Anybody who visits the Our Lady of Mt. 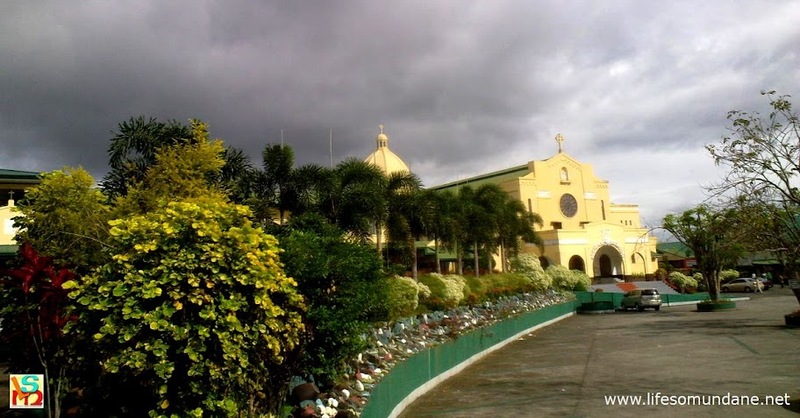 Carmel Church in Lipa City will likely immediately sense that it has a feel to it quite distinct from most other churches. Perhaps, it is because of the imposing medieval façade of the church. Or perhaps it is because of the stillness and serenity you just do not get in many other places of worship. Or maybe it is just from the sheer knowledge that this church of all in the entire nation has been so privileged as to have been visited by the Mother of God. That the apparitions took place at all was due in no small way to the faith and innate strength of the young postulant, who was supposed to have been visited by sinister forces which in retrospect appear to have been aimed at preventing the apparitions. Image credit: Life Magazine. Photo sent in by Jigger Gilera, MD. Pilgrims from all over came when word leaked out about the apparition of the Blessed Mother in Lipa. Teresita’s encounters with the devil happened several times. In one such encounter, the devil inflicted physical pain upon her. “He was terribly ugly. He hit me and the marks were seen by the Mother Prioress.” Then she proceed to describe how the devil looked like. Yet, the apparitions did take place despite the devil’s efforts to trick Teresita into leaving the convent; and would subsequently be remembered for the shower of petals within the grounds of the Carmelite monastery. These would occur spontaneously after the Most Reverend Alfredo Obviar, the Auxiliary Bishop of Lipa, had asked Teresita for proof that what she was experiencing was of a heavenly source. 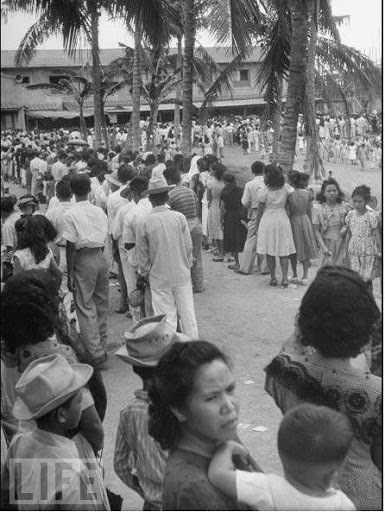 News of the apparitions drew pilgrims and the curious alike; and one of these was my late father, who was at the time a young officer newly assigned to Fernando Air Base. My father was by nature a sceptic of things that supposedly have no logical explanations. Image credit: Life Magazine. Photo sent in by Jigger Gilera, MD. 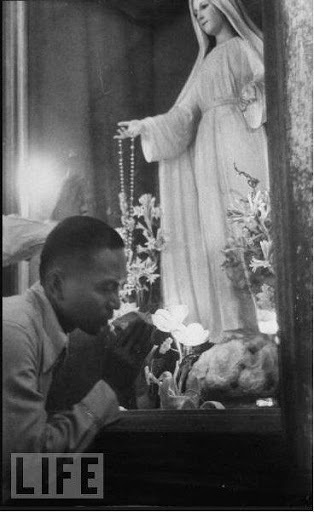 Photo shows a devotee at the foot of an image of Mary Mediatrix of All Grace. While he never did say outright that the apparitions were real, he did tell us of this one time when he went with some fellow Air Force officers and saw with his own eyes one such shower of petals. What my father found remarkable, or so he told us in his succinct way, was how the petals seemed to be falling to the ground in a straight line despite the fact that there was wind and rain that day. Some of these petals, many literature about the apparition say, have religious images etched on them. I had seen two of these, graciously shown by a Carmelite nun when I visited the church with fellow teachers many years ago. One had the clear face of Jesus Christ while the other looked like the image of the Holy Family. In 1951, of course, the apparition was branded non-supernatural or fraudulent by six bishops who composed the committee that investigated the alleged apparition. As a consequence, the Bishop of Lipa and the Mother Prioress of the Carmelite Sisters were released from their jobs. Corollary to an investigation is always a search for motive. In the case of the young postulant, who left the comforts of her affluent home to live in Spartan conditions with the nuns, finding motive really requires a stretch of the imagination. Besides, having personally seen the intricately carved images on rose petals, if indeed the apparitions were a hoax, they certainly redefined the meaning of the word elaborate. Just how do you carve images on a rose petal? By the way, those images that I saw were by no means a fluke of biology.